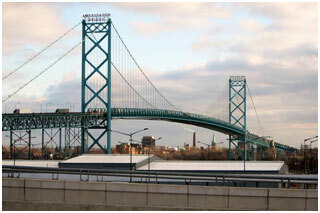 The Ambassador Bridge is a suspension bridge connecting Windsor, Ontario and Detroit, Michigan. The bridge is one of the busiest border crossings worldwide in terms of the volume of merchandise trade that it accommodates between the United States and Canada. Construction on the bridge began in 1927 and was completed in 1929. Designed by the McClintic-Marshall Company from Pittsburgh, Pennsylvania, the bridge displays prominent art deco and modern design features. The components of the bridge were built at the McClintic-Marshall Company’s plant in Rankin, Pennsylvania and shipped to Detroit once they were complete. The McClintic-Marshall Company was also responsible for hiring engineering consultants to oversee the project; these included Colonel C. N. Monsarrat and Philip L. Pratley, both of whom belonged to a Montreal engineering firm. Many individuals were employed during the construction of the bridge, and this number varied depending on the phase of the project. For example, at one point more than six hundred individuals were employed on the project. Though the bridge was initially designed with heat-treated cables, these needed to be replaced with traditional cold drawn steel wires to prevent potential breakage. The bridge was completed ahead of schedule in November 1929, and it began to accommodate traffic soon after. At the time of its completion, the bridge held the title as the longest central suspension bridge in the world. The bridge’s total length is 2286 meters, and the road on the bridge is approximately 15 feet wide. In 1999, traffic on the bridge peaked at 12.7 million total crossings. However, this number has since decreased, now averaging 7.5 million vehicles annually. The Canadian government has, since 2005, had plans to build a new bridge in honour of Gordie Howe, a well-known hockey player for the Detroit Red Wings. Though this new bridge would potentially create jobs and produce other economic benefits, it would also reduce the toll income of the Ambassador Bridge by anywhere from 35 to 50%. Manuel Moroun, the owner of the Ambassador Bridge, and entities under his ownership have filed lawsuits in response to plans for a new bridge. However, construction on the new bridge is expected to begin sometime in 2018. Ambassador Bridge. (n.d.). Southwestern Ontario Digital Archive. University of Windsor. Ambassador Bridge Records (1927-1930). (n.d.) Special Collection Finding Aids, University of Michigan Library. Building The Bridge: A 1927-29 Silent Film (video cassette). (2001). Windsor, Ont. : City of Windsor. Delay, delay, delay; The Canadian-American border. (2017, September 9). The Economist, 424(9057), 33(US). Detroit International Bridge Company. (1979). Spanning Half A Century. Detroit International Bridge Company. (n.d.). Annual Report. 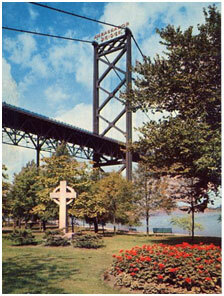 Mason, P. (1987.The Ambassador Bridge: A Monument To Progress. Detroit: Wayne State University Press. Mossman, M. (2017). Crossing Guards: When private ownership of a bridge gets old. Harper’s Magazine, 335(2011), 37-43.